﻿ There have been few rock success stories more satisfying to watch than that of Neck Deep. In under five years they’ve gone from a Story So Far ripoff to a slightly better Story So Far ripoff to releasing Life’s Not Out To Get You in 2015, perhaps the best pop-punk album a UK band has ever released and a trailblazing release in its own right that nestled them right at the top of the genre’s modern elites. And yet, it’s been a rocky road to get to this point. Beyond lineup changes and public controversies, plenty has happened behind the scenes to manifest itself in The Peace And The Panic, the band’s third full-length that sees them looking inward, taking their usual pop-punk into new, more introspective directions – here, the colours have all been drained, and if life wasn’t out to get you last time, it sure is now. There are two major points that spur such a shift on, the first being, obviously, the state of the world today. Don’t Wait takes jabs at lying governments and media outlets wanting to keep the masses ignorant (along with an utterly devastating vocal turn from Architects’ Sam Carter that pushes the track to the next level), but the real soundtrack to the apocalypse comes in Happy Judgement Day, a disconcertingly joyous track aiming its shots at as many ills of the modern world as it can. Neither are particularly groundbreaking (even though both are adorned with the sort of hooks most bands would sell their left leg for), but they’re only really the backdrop for the more incisive turmoil that this album explores. That comes in the second point, the concept of mortality brought on by the passing of both vocalist Ben Barlow’s and bassist Fil Thorpe-Evans’ fathers during this album’s recording. But even with the acoustic lament Wish You Were Here and the oddly jaunty recollection of a family’s growth on 19 Seventy Sumthin’ serving as the lynchpin moments for this particular theme, far more noteworthy are Motion Sickness and Where Do We Go When We Go. The former is an open recognition of the turbulence of life after a conversation between Barlow and his father’s ghost, while the latter almost serves as a follow-up of sorts, using those lessons as the catalyst to make the most of life in case there really isn’t anything when we go. Alongside Barlow’s examinations of himself while engulfed in such a climate on The Grand Delusion and In Bloom, The Peace And The Panic serves as a much more detailed study of a rocky modern existence than most other pop-punk bands would even dare to attempt. Then again, The Peace And The Panic isn’t entirely a pop-punk album. It’s not a massive shift, but a lot more than previous, Neck Deep are dipping their toes in shades of pop-rock more than ever before. And it really would be covering up the obvious if how inconsistent this can be wasn’t mentioned; its fair share of rougher, exposed edges are left in on Motion Sickness and Don’t Wait, but they find themselves dipping into cleaner, more directly melodic instrumental lines on Critical Mistake and 19 Seventy Sumthin’, and with producer Mike Green’s involvement, known for his work with Pierce The Veil and Paramore, it’s a wonder any exposed edges are left in in the first place. Saying that, and compared to so many other bands who edge their material in a poppier direction, Neck Deep actually know what they are and aren’t good at, and even when there does feel like a compromise in sound, another moment moves in the opposite direction towards something newer with clear advantages. So even though Wish You Were Here and 19 Seventy Sumthin’ err on the side of supremely polished to the point of losing bite almost immediately, Parachute and In Bloom sound utterly fantastic in their embrace of grittier, downcast emo-pop, and there’s a surprising amount of cohesion to Sam Carter’s bridge on Don’t Wait that suggests that Neck Deep moving into heavier climes could actually produce something worth paying attention to. Even without that though, it would be foolish to count Neck Deep out at this point; the trajectory they’ve taken has landed them in a place where failure is essentially an impossibility, and though The Peace And The Panic isn’t quite up their best, it’s an impressive enough underlining of just where this band is at. It says a lot that they’re trying to expand beyond the basic pop-punk framework too, and for their first real foray into material that’s slightly cleaner and shinier, it could certainly be a lot worse. Bolstered by songwriting chops that have more colour and character than their genre usually gives room for, and chorus-writing capabilities that will take some beating by even the most seasoned of acts, Neck Deep are hurtling towards superstardom at a rate that’s hard to keep up with. 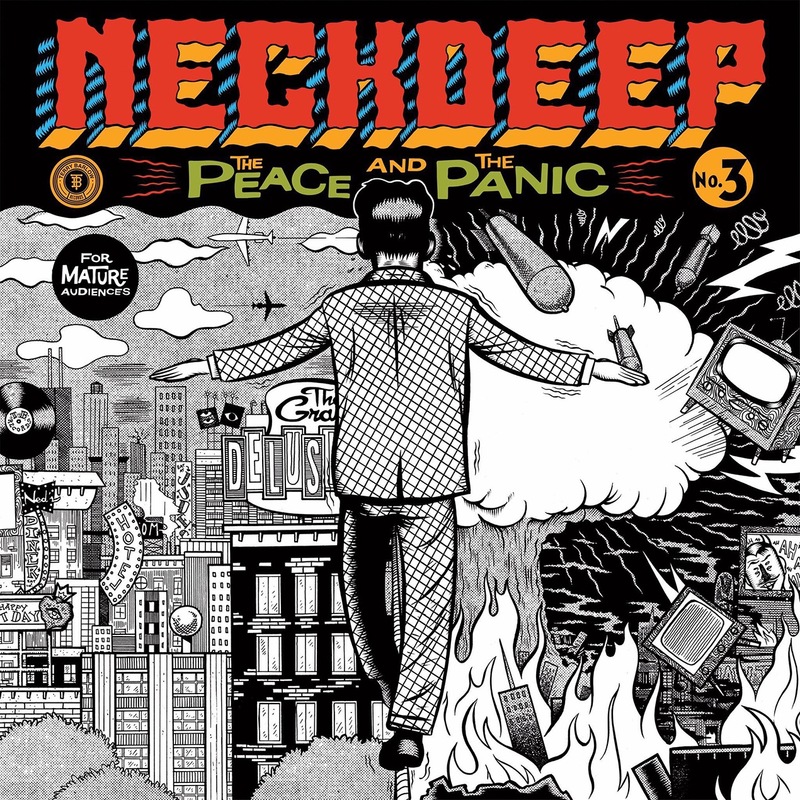 ‘The Peace And The Panic’ by Neck Deep is released on 18th August on Hopeless Records.